We stock several window films that make glass stronger and shatter resistant, available in 100 microns to 350 microns thicknesses. Incredibly strong, optical-quality polyester, high-grade ultraviolet inhibitors, and special laminating and mounting adhesives are what make our safety films exceptionally tough. Once installed to the inside surface of glass, the special mounting adhesive forms a molecular bond, strengthening the overall integrity of the pane keeping glass fragments in place. The Solar Window Film reflects the hot sun in the summer and cool air in the winter by forming a layer on your windows, keeping you comfortable all year round. Say goodbye to annoying glare while reading or watching television. 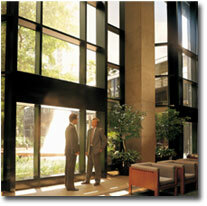 Our window films pay for themselves through the energy savings they generate. Privacy can be achieved by the application of several different types of film. Translucent and Opaque Film allows the determination of light and dark movement, but not detail, to the passer by, whereas Daylight. Reflective Film allows people to see out but not into your property and for total privacy, Blackout Film can be utilised.